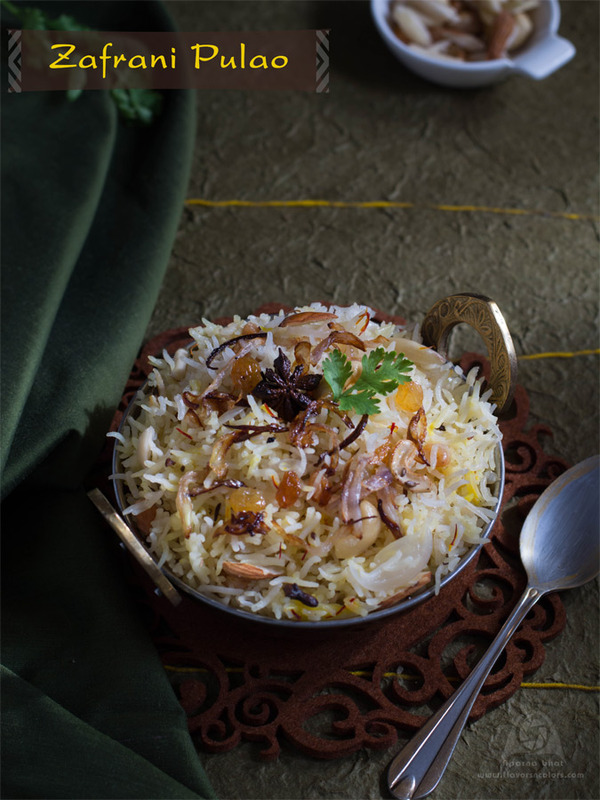 Zafrani pulao is saffron scented rice, flavoured by using spices. 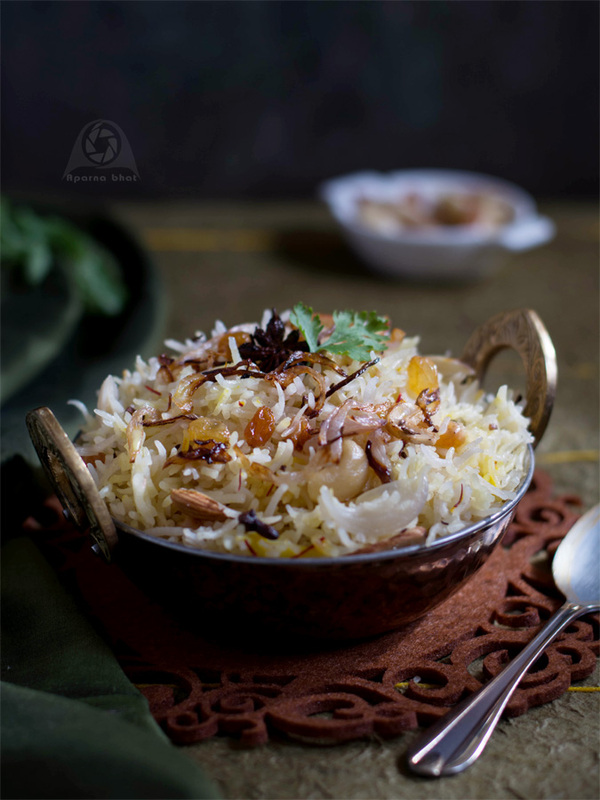 A royal rice dish, it is made with rice, ghee, spices and favourite dry fruits. Below is an amazing recipe which can be prepared on special occasions that will get you wow from your family and friends. Wash rice clean and soak in just enough water for 30 minutes. Drain the water after 30 mins. Soak saffron threads in 4 tbsp hot milk and keep it aside. Heat 1 tbsp ghee in a deep pan. Add raisins, broken cashews and fry it gently. Keep it aside. Add half quantity of finely sliced onion in the pan and saute it until golden brown. Keep it aside. [We will use it in parts]. In the same pan heat 1 tbsp ghee. Add shahi jeera, cinnamon stick, cloves, green cardamom, bay leaf, star anise one by one and saute them for few seconds. Add remaining finely sliced onions and saute it until they turn transparent. Add soaked and drained rice. Saute it for a minute. Add nutmeg powder, salt to taste, sugar to taste and mix it well. Pour 1 and 1/4 cup lukewarm water, cover the pan and let it cook it until the rice is half done. Once half done add milk, cover the pan again and cook on sim flame for 5 mins. Now sprinkle soaked saffron milk, roasted dry fruits and silvered almonds. Mix it well. Cover and continue to cook for 2-3 minutes. Switch off the flame and allow the rice to stand for 10 minutes before you open the pan. After 10 minutes fluff up the rice gently with a fork. 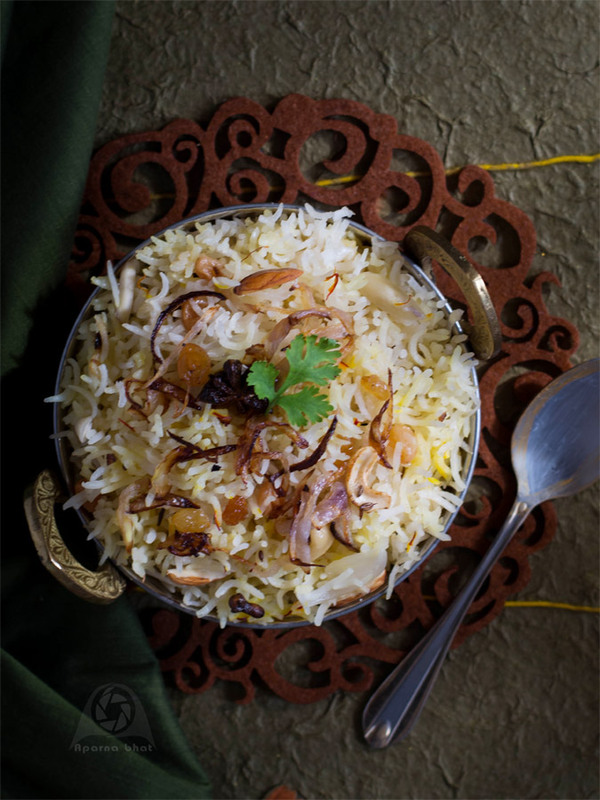 Garnish with roasted dry fruits, fried onions and chopped coriander leaves. Serve it along with accompaniment of your choice.